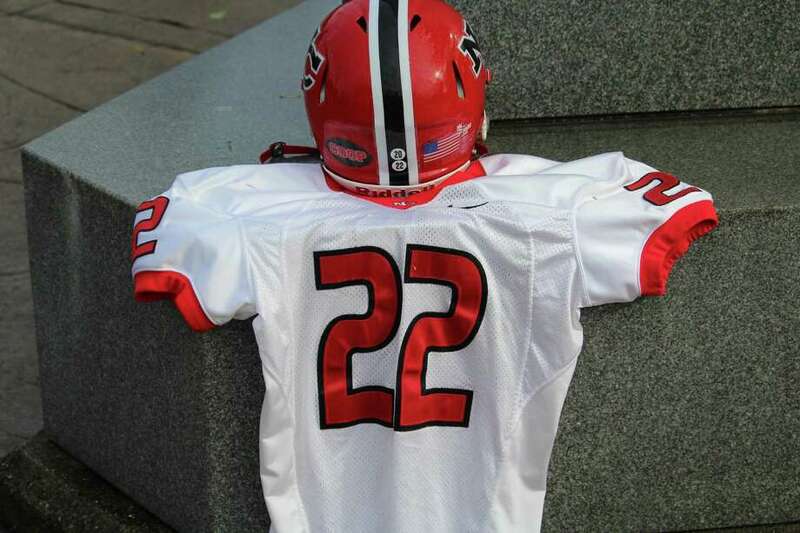 New Canaan is honoring the late Jason Cooper with his No. 22 jersey and a "Coop" sticker on the back of its helmets. NEW CANAAN — Early in the first quarter of the New Canaan football team’s opener at St. Joseph, a Ram safety wearing No. 22 intercepted a pass deep in his own territory. Eyes quickly scanned the roster, searching for a name that wasn’t there. That’s because the young man wearing the jersey was Quintin O’Connell, a senior captain for New Canaan. O’Connell, who normally wears No. 20, donned 22 in honor of Jason Cooper, the New Canaan receivers coach who passed away on July 7 of a heart attack at age 52.
Cooper was a Ram lifer, having played for Lou Marinelli in the 1980s and earning All-FCIAC and All-State honors in both football and lacrosse . One of the better athletes to come through New Canaan, Cooper earned a scholarship to Duke University, where he played both sports, eventually ending up on the practice squads of the Dallas Cowboys and Miami Dolphins before starting a financial career in Chicago. Eventually Cooper left the financial world and returned home to New Canaan, where he told Marinelli that he longed for the type of relationships established through football. Cooper’s deep impact on the current crop or Rams inspired them to honor him throughout the season. On the back-left corner of the Rams’ helmets this season, a black football resides with the word “COOP” in red lettering in the center. Still, it wasn’t quite enough. So, before the season kicked off Marinelli came up with the idea for O’Connell to wear Cooper’s No. 22 in his memory. O’Connell was flattered, but hesitant to accept the responsibility, citing his desire to honor Cooper without bringing attention to himself. But, his teammates convinced him. As a senior captain and a three-year starter O’Connell would bring the type of class and effort to the jersey that Cooper would be proud of. That phone call to O’Connell is just one example of what made Cooper so special and loved around the program. Marinelli has seen plenty of talented players and coaches come through the program in his 37 years, but Cooper’s personality transcended all he accomplished on the field. What the future of the iconic jersey holds for 2018 is still a question mark. O’Connell knows he’ll once again wear it for the Rams’ home-opener against Danbury on Friday night, and after that it will either become his for the year or rotate to a deserving player for each game. Now, there’s work to be done on the field, but it’s tough for a group used to having that larger-than-life figure patrolling the sidelines. Even now, two months later, Marinelli still finds himself walking to the field with the intention of running something by Cooper, only to remember that he isn’t there. And for teenages with classes, athletics, relationships, friends and college already on their plate, it can be overwhelming to cope with a loss that hits so close to home. In that regard, every little gesture helps. Even something as seemingly inconsequential as a jersey. “It wasn’t just the receivers, it’s the entire team and the entire New Canaan football community,” O’Connell said of Cooper’s impact. “I know personally with my brother (Ryan, class of 2017) and all his friends, they all got together after they heard the news. Everyone has been there for each other, it’s been a roller coaster — especially within the first couple weeks — because it’s emotional with the season starting up, it really comes back full force again because the big man isn’t on the sidelines where you know him to be.